Tir na nOg runs the Admission’s Class/Montessori School in Scoil Chaitriona, 59, Lr. Baggot St where children can avail of our free ECCE scheme 9am to 12 noon. 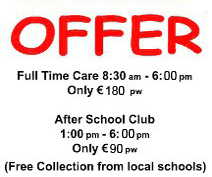 We also offer afterschool care till 6pm daily at a rate of €90 per week.